This book, Izakaya by Mark Robinson has great pics, easy to make and interesting recipes as well as quirky anthropological detail about the eight Tokyo “pubs” or izakaya (more like drinking houses) featured in the text. It’s at once encyclopaedic (see Japanese aromatics info on p.66-69, 2008 hardback edition) and historical, as well as entertaining and culturally informative (see p.93 on etiquette). 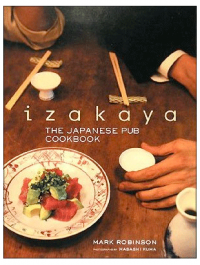 But this book’s most important contribution is that it introduces to the English speaking reader a wonderful eating institution that is perhaps the most democratic of Japanese institutions–all ages and classes of Japanese eat at izakaya. While “pub” might evoke that down to earthiness of izakaya, it is not a perfect translation for Australians, who see pubs as primarily drinking joints, with some bad food thrown in, often to soak up the alcohol. Some izakaya, especially big chains, can be full of adolescent Asahi Dry guzzlers, but some izakaya can have very exotic and sophisticated menus, and be at the cutting edge of culinary fashion. The eight Tokyo eateries chosen by Robinson are a good cross section–with boisterous local pubs to sophisticated quiet types. What they have in common is interesting food-while they are Japanese in presentation (small!!!) and inspiration, there are brazenly fusion dishes like Fried Tofu Stuffed with Raclette Cheese (p.80) which Kei tried with good results. And that’s the great thing about this book–it helps readers to expand their knowledge of Japanese cuisine beyond the tempura/teriyaki/sushi trifecta that dominates the image of Japanese food in Australia. If you are interested in food narrative, you can read this book in all its precise detail, especially the stories about the chefs and owners of the izakaya featured. Or if you like the recipes, just go for them, and there are plenty here to whet most appetites. Those who read the pictures, there’s also much to enjoy–love the detail like the hexagonal cross-section chopsticks (for firmer gripping) on p.41, or the bikini beer girls and their seasonal significance, or the monochrome yakitoriya photos towards the end of the book that evoke old worldly post war Tokyo. This book is a cookbook, but more, with elements of Donald Richie’s classic on Japanese food, A Taste of Japan, and is unique among Japanese cookbooks, indeed all cookbooks. Kei and I urge you to try some of the recipes, and if you are travelling to Japan, we urge you to dine regularly at izakaya. Try to find small ones by looking out for beer signage.